Consultancies are famous for giving tough interview questions to their candidates, ranging from tough, on-the-spot math exercises to "mind-teasers" and case studies. Harder still, Business Insider says, are questions from the dreaded situational interview. Here, recruiters ask candidates to describe tricky situations in which they've had to make instinctive decisions; whatever answer a candidate might give will afford the firm valuable insight into how each candidate might react in stressful circumstances in the workplace. Business Insider compiled a list of 15 of the toughest questions they've heard asked in a situational interview. Accenture repped the consulting industry by claiming one-third of the 15 most difficult. Let's have a look. Here's a priceless treasure: not only have I provided the Accenture questions (via Business Insider), I've also created a veritable field guide on how not to answer them! Below, the bulleted, emboldened interview queries are all legitimately from Accenture. Everything else is proprietary Reynolds stuff. •Accenture: Tell me about a difficult co-worker who you're having a conflict with. o"Well, there's this guy David. He stole my girlfriend so I cut off one of his ears. Is that what you mean?" oTakeaway: Don’t cite any conflicts in which you violate normal office etiquette and/or resort to extreme physical violence. •Accenture: Tell me about a time when you had to make a split second decision. o"You mean, like right now? My interviewer asked a ridiculous question about split second decisions and this was the most recent example I could think of." oTakeaway: Do not insult the quality of the questions being asked. It will only make things worse. •Accenture: Tell me about a time when you had a problem working in a group. o"My boss asked me to attend a sales team meeting. I don't work in sales and I don't respect salesmen. So I spent an hour in the bathroom reading Miniature Donkey Talk on company time." oTakeaway: Don't be too honest. They say that honesty is a virtue; if that's true, then bullsh*tting should be a golden rule. •Accenture: Describe a time when you convinced someone who initially disagreed with you to follow your recommendation. o"My friend wanted to go see the Fellowship of the Ring, but I preferred Chronicles of Narnia. I told him I'd give him $80 and a backrub if he'd go to Chronicles. He took the deal." oTakeaway: Don't accidentally give yourself away as an idiot. Keep it generic; limit detail and focus on the key takeaways of the situation. You don't want to let a minor detail—a political reference or an interviewer's pet peeve—determine how you'll be judged on a whole. •Accenture: Tell me how you saved your company money. o"I rarely use toilet paper, saving money on cleaning supplies and even cutting back on our carbon footprint." oTakeaway: All of the aforementioned takeaways could probably apply here, actually. 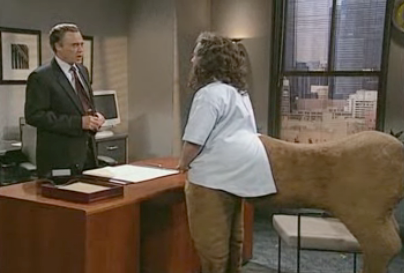 Never, NEVER go to an interview if you have the body of a horse.